If you haven’t been watching BoJack Horseman, you should be. There are three seasons of it on Netflix and it is sharp, funny, wry, and excellent — but it also cuts close to the bone on mental heath issues. The constantly self-medicating titular character is clearly struggling with anxiety and depression after years in the media spotlight followed by hiding at home as a has-been, and mental health plays a very prominent role on the series. Or maybe you’d prefer Lady Dynamite, Maria Bamford’s latest, which also takes on the subject of mental health in a live action series. There are a few things these shows have in common. One is the fact that they are both comedies. They are explicitly in many ways mental illness comedies. This is not how people are used to seeing mental illness presented on television. Either it’s a grim tragedy, or something that makes a character act out of control and dangerous, or it’s a subject of mockery. But this is high comedy wrapped around mental illness, the kind of comedy filled with in-jokes that I get as a viewer, and identify with, and am shocked by only because they are vanishingly rare on television. Disability in general is often treated as something that can’t be comedic. It can be sad, and it can be inspiring, and it can even be something to mock, but the idea of disability comedy is kind of alien and scary to many people. It both celebrates disabled identities and references that sometimes, disability can be kind of hilarious, even as it can also cause frustration, discrimination, and isolation. For disabled viewers, this kind of comedy is incredibly affirming, because it feels like us, our lives, and celebrates who we are rather than trying to hide it. Both shows are also on Netflix. They aren’t broadcast shows, they’re streaming shows. Streaming media is getting bigger each year, with Netflix, Hulu, and Amazon competing to offer the best original content while building up their backlist of syndicated material from around the world. People are watching streaming not just because it’s accessible, but because it has programming they can’t get anywhere else. Streaming in a sense is becoming its own network. Meanwhile, programs like Fridays and Her Story, which was nominated for an Emmy despite its very nontraditional platform and format, are running on YouTube, with creators financing their own projects and putting them up in the hopes that people will get interested. There’s something interesting happening here: A lot of marginalised creators are turning to streaming to get their work distributed, because mainstream options are slim, and there’s a lot more diverse representation. On the one hand, this troubles me, because I don’t like that we aren’t seeing this on mainstream television — I really dislike ‘go make it yourself then’ attitudes, as they totally ignore the fact that there are huge structural inequalities in the industry that make it very hard for people to just go make it themselves, and when they do, they’re going to struggle to get distribution and the kind of audience that mainstream shows get. Fox has a bigger reach than Her Story’s YouTube channel. It just does. That’s how it is, and that’s something that needs to change. I don’t want to see diverse creators pushed into streaming and told that they can play in the sandbox while the big kids make things for television. I want to see that diversity spilling over and getting all up in the major networks. But I also like that streaming provides some comparative freedoms. People can take bigger risks, both as creators and as hosts, when it comes to developing this kind of content. And those risks can pay off big: House of Cards and Orange is the New Black are both huge, with Orange featuring some very diverse characters. Transparent, loathsome as it is, is also huge, and it provides a good example of how streaming misses the mark every bit as much as conventional television at times. But when you pull back and look at the big picture, an important truth is emerging. Creators are using Netflix to tell stories that everyone told them no one wanted to listen to. They are proving that there is an audience for those stories. And that will lead to shifts in the industry if it wants to keep pace with reality. 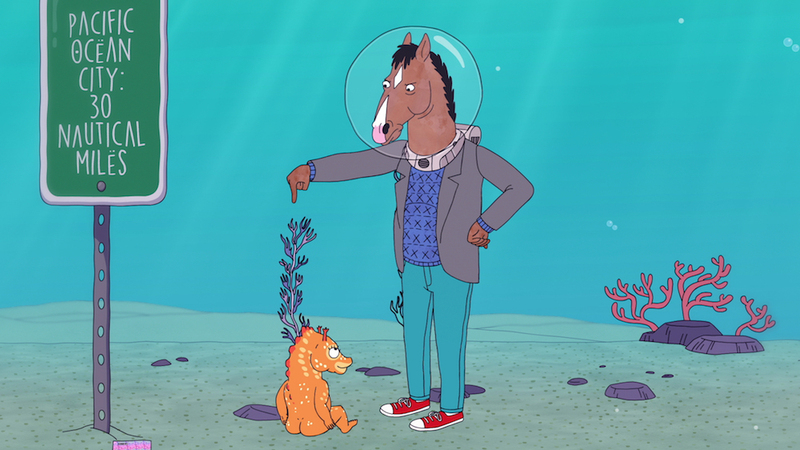 For every new season order of a show like BoJack, which Netflix renewed almost immediately after the third season went live, streaming is internalising and repeating a message. People are ready for this. They want it. They are willing to pay for it. No everyone loves BoJack. The humour isn’t to everyone’s taste, and the experiences depicted aren’t universal. But it’s a radical departure from what we’ve had before, and that represents something important. A door opening to the possibility that we will get to see other diverse creations, more of a dramatic range. If there were 100 mentally ill main characters on television, think about the range of lived experiences that could be depicted, about how very disparate relationships to mental illness could be explored. It would be glorious! And that’s the enticing possibility that streaming is given us, there for the taking if we want to grab it.